Dolphin Stadium has the world’s largest HD display — 137 feet wide, 50 feet high, 1,750 inches diagonal viewing, 720 lines progressive scanning. Now that is going to look cool. Too bad half the fans will be too drunk to notice (at least that has been my experience in Miami). 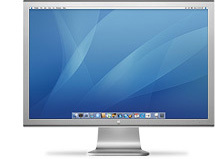 I just picked up a 23-inch Apple Cinema HD Display and gorgeous doesn’t begin to describe how it looks. 1920 x 1200 pixels of viewing area. I don’t know how I did any work in Photoshop before with a 17“ Studio Display. Being able to see your documents at 100% saves a lot of time — no more shuffling windows and palettes around. No more resizing documents. Improved workflow.